Lone Pine or Plateau 400 at Gallipoli was the scene of a major diversionary offensive launched by the Australian 1st Division on 6th August 1915. 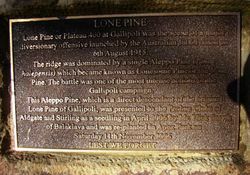 The ridge was dominated by a single Aleppo Pine (Pinus halepensis) which became known as Lonesome Pine or the Lone Pine. 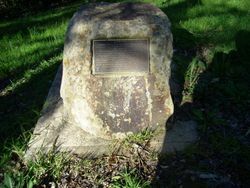 The battle was one of the most intense actions of the Gallipoli campaign.